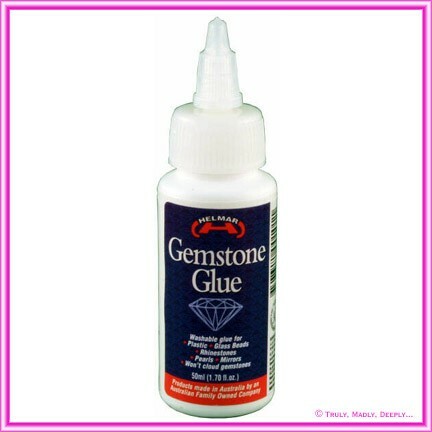 Helmar Glue Gemstone 50ml - the ultimate DIY glue for silver backed diamantes & rhinestones. Will not cloud or eat the back of glass or plastic gemstones, rhinestones, diamantes, pearls and beads. An essential product for anyone gluing diamantes and rhinestones to wedding invitations and scrap booking projects! Dries Crystal Clear - almost invisible making it great for stationers gluing beads & glitter to cards etc. Water based but not soluble after drying. Washable - glue rhinestones on kids costumes! Glue decorations to mirrors etc. Non-Toxic - great for the kids and can safely spread with fingers. Tested on & recommended for all Paperglitz Diamantes & pearls. When applying to small items, use a toothpick to apply the gemstone glue.